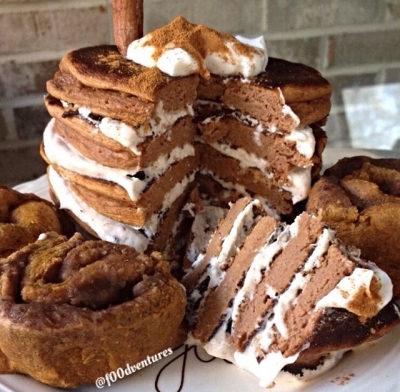 This pancake recipe combines two fall favorites - pumpkin and cinnamon rolls! These pumpkin pancakes are layered with a cinnamon date caramel filling then topped off with a couple 5 minute pumpkin cinnamon rolls (recipe on @f00dventures ig). Go big or go home! Combine ingredients to make your pancakes. Cook up like you would regular pancakes. Set aside to let cool. combine ingredients to make your filling. Layer inbetween your pancakes. I topped mine off with a couple 5 minute pumpkin cinnamon rolls (recipe on @f00dventures IG).